Destroy user interface control1] In India, the total prevalence of dementia per 1000 people is 33.6%, of which AD constitutes approximately 54% and vascular dementia constitutes approximately 39%. AD affects approximately 4.5 million people in the United States or approximately 10% of the population over the age of 65, and this number is projected to reach four times by 2050. The frequency increases to 50% by the age of 80 years. Every year more than $100 billion is spent for health care in the U.S. to treat AD in primary care settings alone. Destroy user interface control3] The main protein component of amyloid in AD is the 39-42 amino acid (beta) amyloid peptide (A-beta) [Figure 1]. Botanical name: Curcuma longa; Family: Zingiberaceae, the ginger family. Turmeric is a sterile plant and does not produce any seeds [Figure 2]. The plant grows up to 3-5 ft tall and has dull yellow flowers. The underground rhizomes or roots of the plant are used for medicinal and food preparation. The rhizome is an underground stem that is thick and fleshy ringed with the bases of old leaves. Rhizomes are boiled and then dried and ground to make the distinctive bright yellow spice, turmeric. Probably originating from India, turmeric has been used in India for at least 2500 years. It is most common in southern Asia and particularly in India. Turmeric was probably cultivated at first as a dye and later on it was used as cosmetic and as an auspicious and aromatic food substance. It possesses antiseptic, anti-inflammatory detoxifying properties as well as carminative properties. Turmeric has a long history of medicinal use in South Asia and was widely used in Ayurvedic, Siddha and Unani systems. It is thought to be a hybrid selection and vegetative propagation of wild turmeric (Curcuma aromatica), which is native to India, Sri Lanka and the eastern Himalayas and some other closely related species. Worldwide, there are over 1000 published animal and human studies, both in vivo and in vitro in which the effects of curcumin on various diseases have been examined. Studies include epidemiological, basic and clinical research on AD. The process through which AD degrades the nerve cells is believed to involve certain properties: inflammation, oxidative damage and most notably, the formation of beta-amyloid plaques, metal toxicity [Figure 3]. There have been several studies on effects of curcumin on AD. Outlined below are some of the studies and their conclusions. Destroy user interface control12] using doses of 4, 5, 10, 15, 20 microM concentration of curcumin in C-6 rat glioma 2B-clone cells, a mixed colony of both neuroglial cells in a six- day trial, showed that curcumin dose dependently stops the proliferation of neuroglial cells, by differentiate into a mature cell or undergo apoptosis. It inhibits neuroglial cells proliferation dose dependently (i.e.) higher the concentration, the greater the inhibition. It has shown to decrease the glutamine synthetase (GS) assay, a marker enzyme for astrocytes. In the same study, curcumin was shown to increase CNP (2′3′- cyclic Nucleotide 3′-phosphohydrolase), a marker enzyme for oligodendrocytes. 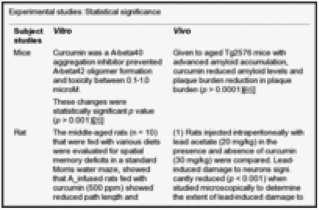 The overall effect of curcumin on neuroglial cells involves decreased astrocytes proliferation, improved myelogenesis and increased activity and differentiation of oligodendrocytes. Destroy user interface control16] Overall, curcumin decreases the main chemical for inflammation and the transcription of inflammatory cytokines. Curcumin inhibits intracellular IL-12 p40/p70 and IL-12 p70 expression. The exposure to curcumin also impaired the production of pro-inflammatory cytokines (IL-1, IL-6 and TNF-). These studies indicate a potent inhibitor of pro-inflammatory cytokine production by curcumin and it may differ according to the nature of the target cells. Destroy user interface control25] Glutathione is an important water-phase antioxidant and essential cofactor for antioxidant enzymes protecting the mitochondria against endogenous oxygen radicals. Its level reflects the free radical scavenging capacity of the body. GSH depletion leads to tissue damage due to lipid peroxidation and oxidative damage. Destroy user interface control26] At higher concentration, curcumin binds to amyloid beta and blocks its self assembly. The key chemical features in amyloid beta are the presence of two aromatic end groups and any alterations in these groups has profound effect on its activity. Destroy user interface control40] It is also measured in urine at a dose of 3.6 g/day. Absorption is poor following ingestion in mice and rats. 38% to 75% of an ingested dose of curcumin is excreted in the feces. Absorption appears to be better with food. Curcumin crosses the blood brain barrier and is detected in CSF. Five animal and two human studies showed statistically significant P values. Destroy user interface control50] however, large-scale human studies are required to identify the prophylactic and therapeutic effect of curcumin. 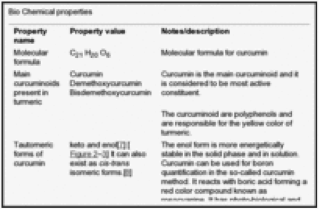 Several unanswered questions remain: What is the one main chemical property of curcumin that can be exploited in treating AD? What is the role of curcumin in other neurological disorders such as Parkinson's, Huntington's and other dementias? How does curcumin interact with neuronal plaques? Is it effective only as a food additive? Would it be effective when used alone or with other anti inflammatory drugs? 7. Kolev TM, Velcheva EA, Stamboliyska BA, Spiteller M. DFT and experimental studies of the structure and vibrational spectra of curcumin. Int J Quantum Chem. 2005;102:1069–79.